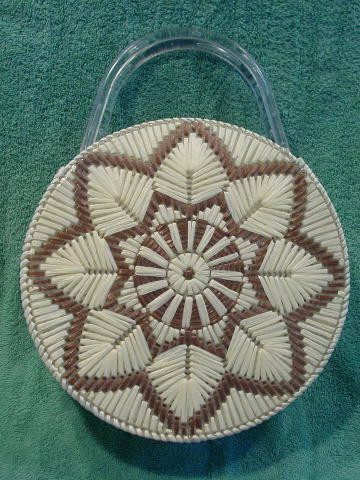 This round vintage purse has a clear plastic (vinyl) covering on the outside and inside. The edges and the areas where the handles are attached are not covered in the clear plastic. The twine weave is on a hard plastic base. The twine, which has the appearance of straw, is in a pale yellow-vanilla and golden-light brown color. It has two plastic (looks like lucite) clear 14" by 3/8" handles which have some scuff marks. 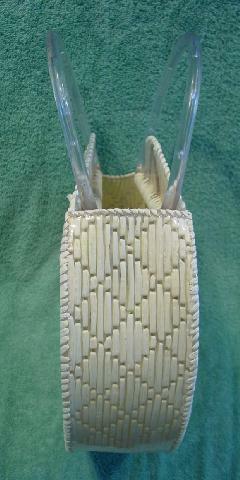 top opening side to side 9" by 2 1/4"
bottom center of handle to top edge of purse 3 3/8"